Then an idea popped into my head. My side of the family leaving for Florida on Friday and one of our favorite places to visit is Pineapple Willy’s in Panama City Beach. They have great beach food and are known for their pineapple cole slaw. PERFECT! I thought I would try to find a similar recipe to create for my husband’s side of the family. I searched the internet and found Lorri’s Pineapple Coleslaw on Food.com. Just thought I would share the recipe with you! Prep time is only 15 minutes. Mix cream, mayo, sugar and vinegar. Add cream dressing to cabbage and pineapple. Store covered in refrigerator 1-2 hours before serving. The recipe serves 8 people and it’s only 15 minutes prep time. IT WAS DELICIOUS! Tasted just like my favorite slaw from Pineapple Willy’s! I had to triple the recipe since my husband has a large family, but the end result was very yummy! This looks so good. I’m hosting a recipe only link party today called “Cast Party Wednesday”. This recipe would be a perfect addition. I would love it if you came by and shared some of your recipes with us. I like pineapple coleslaw but my recipe doesn’t have the half and half. I use yogurt where you use that and less mayo and the result is awesome!! 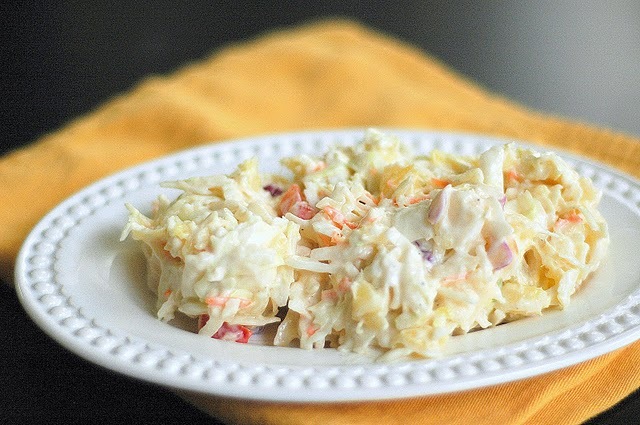 I have tried many recipes for coleslaw, but I never came across one with pineapple in it….I love it. This looks delicious and great for summer! My hubby and I love coleslaw. Thanks for sharing. I see only cabbage and pineapple in the recipe ingredients: what makes the bright orange colors in the photograph? It looks as if it could be carrots and/or red pepper. Are there indeed other ingredients? I used a bag of cole slaw mix and it had little bits of carrots and red onion mixed in with the cabbage! My family has made pineapple slaw for yrs using miracle whip & crushed pineapple, plus adding small marshmellows. Oh so good! I prefer the pastel colored ones for looks but the plain white is fine.